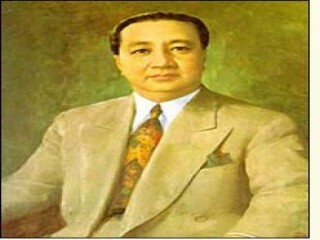 Elpidio Quirino was the second president of the Philippine Republic. During his administration, the Philippines passed through a period of revolutionary turmoil marked by widespread corruption, demoralization, economic crisis, and political terrorism. Elpidio Quirino was born on Nov. 16, 1890, in Vigan, Ilocos Sur, the son of the warden of the provincial jail. Quirino taught school while studying at Vigan High School and then went to Manila, where he worked as junior computer in the Bureau of Lands and as property clerk in the Manila police department. He graduated from Manila High School in 1911 and also passed the civil service examination, first-grade. After graduating from the College of Law, University of the Philippines, in 1915, Quirino served as law clerk in the Philippine Commission and then as secretary to Senate president Manuel Quezon. In 1919 Quirino won the post of congressional representative from the first district of Ilocos Sur. He opposed Sergio OsmeÃ±a, the leader of the Nacionalista party, and joined Quezon's Collectivista faction of the party. In 1925 Quirino was elected to the Senate. Quezon appointed him chairman of the Committee on Accounts and Claims and of the Committee on Public Instruction and to other important congressional bodies. In 1931 Quirino was reelected to the Senate. In the controversy surrounding the Hare-Hawes-Cutting Law of 1933, he sided with Quezon. In 1934 Quirino became secretary of finance. He was also one of the drafters of the constitution approved on May 15, 1935. When the Philippine Commonwealth was inaugurated on Nov. 15, 1935, he held the position of secretary of finance (1935-1936) and then became secretary of interior (1936-1938). In 1941 he was elected as senator-at-large. When World War II broke out, Quirino refused to join the puppet government of JosÃ© Laurel and became an underground leader of the Filipino resistance movement against the Japanese. He was captured and imprisoned by the Japanese military police in Ft. Santiago, and his wife, two daughters, and a son were murdered by the Japanese forces. In 1945 Quirino became the leader of the majority in the Philippine Congress and then assumed the post of president pro tempore of the Senate. On the inauguration of the Philippine Republic in 1946, he occupied the post of vice president and first secretary of foreign affairs. In 1947 Quirino (who belonged to the class of landlords, compradors, and bureaucrat-capitalists) urged the adoption of the anomalous "parity amendment, " imposed by the U.S. government in exchange for independence, war damage payments, and other loans. When President Manuel Roxas died on April 15, 1948, Quirino succeeded him as president of the republic. For his weakness in tolerating rampant graft and corruption in his party, permitting immorality in the armed forces, and neglecting the impoverished plight of the majority of Filipinos, he was very unpopular, and in 1953 he was defeated by Ramon Magsaysay. As president, Quirino was many times justly accused by Filipino nationalists of being extremely pro-American and even subservient to alien economic interests. To maintain peace and order for the sake of national unity, he granted amnesty to the Huk guerrillas on June 21, 1948; but this measure proved futile in solving the deep-rooted social injustice and exploitation inherent in the country's semifeudal economy. Although Quirino saw the need for increasing the appeal for loans from the United States and establishing controls to protect local Filipino industries and conserve natural resources, he failed to act vigorously and sincerely in implementing drastic agrarian reforms. Quirino was elected president in 1949, when, according to historians and newspaper reports, widespread terrorism and violation of legal electoral processes occurred. He died on Feb. 29, 1956. Standard references on Quirino's career and achievement include Sol H. Gwekoh, Elpidio Quirino: The Barrio School Teacher Who Became President (1949), and Hernando J. Abaya, Betrayal in the Philippines (1946) and The Untold Philippine Story (1967). View the full website biography of Elpidio Quirino.